As the name might suggest, Heirloom creates furniture to last, that you can pass down through the family – but they make it for children. And luckily for us, they make it with rather smart mid-century looks. 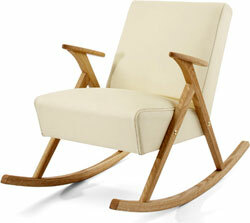 The pick (for me anyway) is this Ellinor rocking chair by Catharina Engelholm, which is available as a one or two-seater. A nice mix of wood and leather, it has a great curved wood feet (available in walnut or birch) and a spill-resistant leather cover for the actual seat in eggshell white. There’s also some hard-wearing cushioning made from jute, horsehair, wadding and cotton fabric. No prices as yet, but you can drop the Swedish company a line about retailers and cost.